Kawakawa A couple of years ago after extensive research Social Policy published two extensive studies focusing on rural electric cooperatives in all of the southern states and their lack of diversity and democracy. We didn’t throw the rock and hide the hand. Labor Neighbor Research & Training Center and its Rural Power Project sent a copy of the studies to every single one of the cooperatives as well as their state and national organizations. We know that they circulated it widely at the national level to all cooperatives in the association. The direct response we received before and after the reports, either soliciting information and their viewpoint or reaction, even opposition, to the stark facts of the reports: zero! We were completely stonewalled. There’s an old saying though, even in the Age of Trump, “you can run, but you can’t hide,” and sure enough some chinks have developed in their wall in South Carolina of all places thanks to reports by Avery Wilks in the capital city paper in Columbia, The State. Wilks ran a piece recently with the headline, “High Pay and Expensive Perks: Has “Absolute Power” Corrupted SC Electric Co-ops,” which gives you a sense of his work, and his research in a series of pieces has duplicated our own with a razor focus on South Carolina, rather than the whole south. 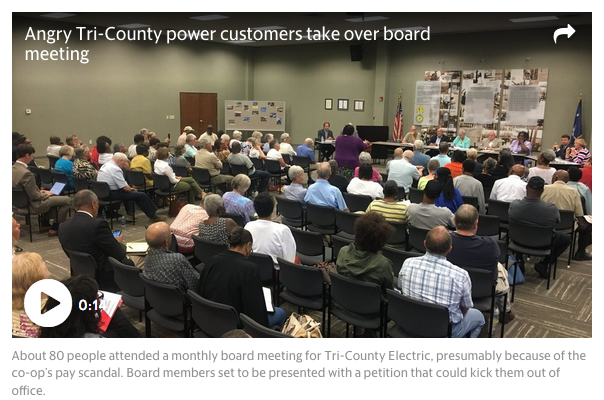 part-time board members at Santee Electric Cooperative doubled their pay for each meeting they attended to $450, held “wasteful” meetings to collect more pay from customers and awarded themselves cash bonuses each year, according to an October 2010 audit. The Kingstree-based co-op spent nearly $342,000 in one year — far above the national average — to send its full nine-member board to out-of-town events and conferences, with some trustees taking their spouses along at the co-op’s expense. South Carolina coops paid their board members nearly twice the national average. In part, that is because all 20 co-ops have offered health insurance to their trustees, 17 have covered former board members and 16 have covered board members’ families. A task force of the co-ops’ national trade association recently advised against paying those benefits in a secret report, and a prominent co-op attorney has warned that paying health insurance benefits to former trustees is not legal in South Carolina. Coops spent about $120,000 last year, on average, to send their boards to educational conferences across the country. Some co-op directors attended from six to 14 conferences in locales ranging from Nashville to San Diego to Washington, D.C.. In many cases, coops have given board members co-op-funded retirement plans, spending money that could have been returned to customers. At one co-op, that plan paid out $81,000 in lump-sum payments to each board member. At another, the plan paid nearly $135,000 to every board member. Seen some co-op board members retain their seats for decades. At 17 co-ops, boards pick the members of the nominating committee that screens candidates for board positions, effectively giving directors control over any potential challengers. Last year, for instance, Tri-County’s nine-member nominating committee for the co-op’s board included six direct relatives of board members. All of this is happening in every state throughout the South with the national association and politicians doing nothing. And, Wilks doesn’t even touch on the issue of racial and gender diversity that we documented. It is obvious that this is a hot mess. South Carolina legislators are now proposing bills to force more transparency and democracy on the electric cooperatives in their state. Now if we could just get more local papers and local legislators throughout the South to get on the job and join us in taking a hard look at the practices of rural electric cooperatives maybe they could be restored to their founding, democratic principles. This entry was posted in ACORN, ACORN International, Citizen Wealth, Financial Justice and tagged electric cooperatives, rural electric cooperatives, utilities by Wade. Bookmark the permalink.